Yep, more jelly. I am STILL a mad canner, outta control. 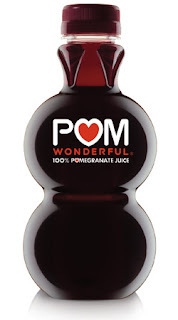 The other day I got an email from the POM Wonderful folks, wanting to know if I'd be interested in trying out their product. Um, yeah! I LOVE pomegranate. I always have. Not as sweet as a grape, not as tart as a cranberry and a total workout to eat. Well lucky me I got a whole box of POM Wonderful. 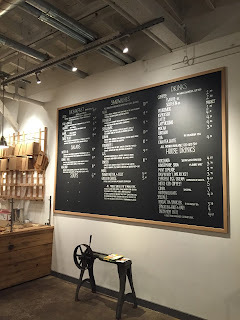 I drank one bottle with fizzy water and lemon. 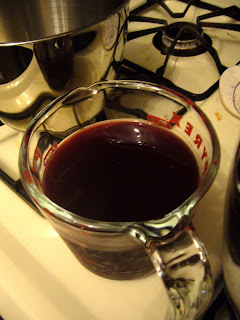 And made a little grenadine with another bottle. But then I decided that what I really wanted to do was to figure out how best to make the gift last as long as possible. I made ice cubes out of one bottle. Which is good for future use, but still, not quite it. 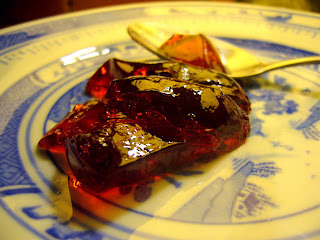 So I made jelly with the rest. And it tastes DELICIOUS! 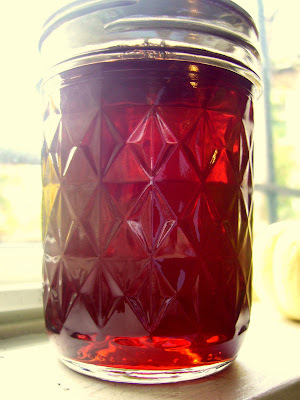 It is not as sweet as the grape jelly I made earlier this week, and it tastes exactly like pomegranate. Shocker, I know. Just so you know, I typically don't use pectin. 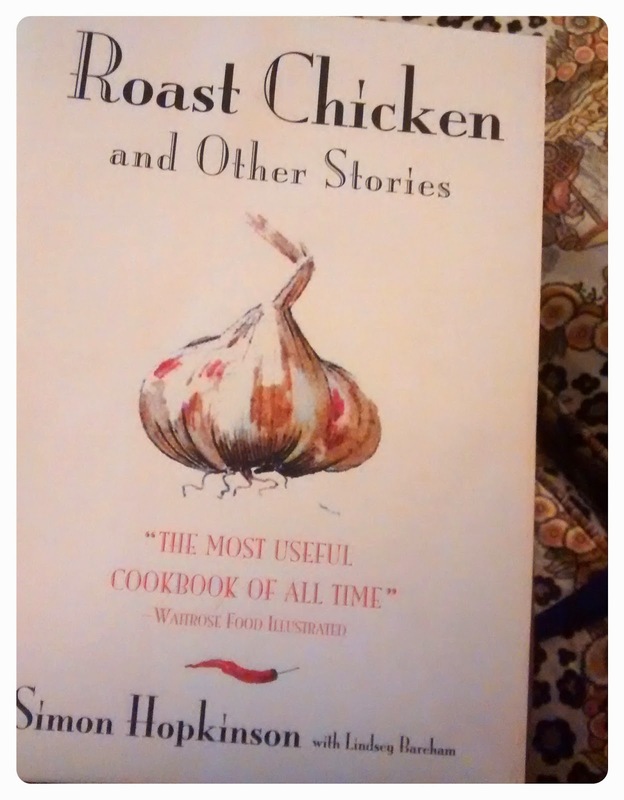 But I wasn't sure how the pomegranate juice would cook up and I did not want to risk wasting all that precious ruby red liquid. I used SureJell Low/No Sugar pectin and figured that the grape jelly recipe on the insert would probably also work for pomegranate juice. Before you start, make sure that you boil your jars and bands for ten minutes to sterilize. Stir the pomegranate and lemon juice together over low heat and bring to a gentle boil. While that is boiling, measure out the sugar. Place 1/4 cup of sugar aside in a separate bowl and stir it together with the pectin. When the juices come to a hard rolling boil, that boils even when you stir it, add in the sugar. Bring it back to the boil, stirring constantly. Then add in the sugar/pectin mixture and stir constantly. This time when it comes to a boil, count off a minute. After a minute, remove the pan from the heat. Ladle into sterilized jars, cap, and process five minutes in a hot water bath. Try not to tip the jelly when removing from the water bath. It will look totally liquidy, but it will firm up as it cools down. 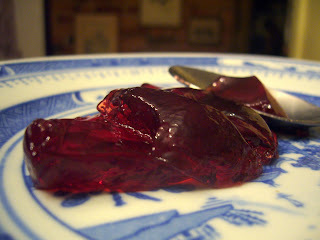 I love making pomegranate jelly. Thanks for this lower sugar alternative! I made a double batch and filled 32 four oz jars. So easy!